Keeping your Rover serviced is a sensible thing to do. It avoids any mechanical problems and keeps the resale value high.But you don’t have to go to a Rover dealer to get great quality Rover servicing in Bradford. At Drive in Service Centre in Shipley we’re real Rover experts, so stop paying the high prices charged by dealers when we you can get the same level of service, repairs and high quality parts at a fraction of the cost. Apart from the bill! You may be amazed to find that our prices can be 60% less than a Rover main dealer would charge – and that’s a colossal saving. Why? Well it’s simple, we don’t share the same overheads that main dealers do, and of course, lower overheads means we can offer much lower prices. 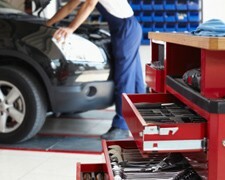 Thanks to Block Exemption, a ruling which states that you can choose where to service your car without threatening the validity of the manufacturer’s warranty in any way, you can find someone else to service your Rover other than the dealer who sold it to you. We’d like to tell you that there’s nowhere better in Bradford or Shipley to have your car serviced or repaired and, once you've discovered our garage, our prices and our service, we think you’ll agree. Get in touch today on Bradford 01274 794991 to find out more about our low prices.